We are often asked how the club chair came into existence and there is no simple answer to the question. It is widely believed that it was a development of the English icon the chesterfield sofa and when you look through our web pages that is easily understood. Up until the seventeenth century a chair was a simple item, literally something to sit on with a wooden seat and back. Gradually furniture craftsmen of the time began fitting arms and padding making them more comfortable to sit on, they became armchairs! By the 18th century high backed padded chairs were coming into being for the rich although even then these could not be described as comfortable, that came later in the Victorian era when fully sprung upholstered deep seated low backed chairs came into being, the club chair was born. 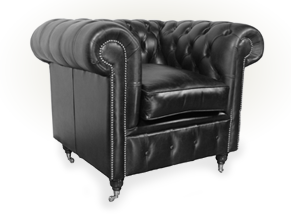 The description club chair harks back to the gentleman's clubs in nineteenth century England where a gentleman could go to get away from his household, go to his men only club where he would sink into a well-upholstered leather chair and relax with a drink and perhaps a cigar. It is known that the leather club chairs were buttoned backed pieces almost certainly companion pieces of chesterfield sofas. Looking through a dictionary definition of club chair, this would describe it as an upholstered easy chair with arms and a low back. Now, although it is possible to cover the club chair with any material, it was traditionally a leather chair and this is the most common finish used today. At Club Chairs.co.uk you have the choice of nineteen club chair types which cover the changes that have been seen over the years since the club chair was first in use in the Westminster gentleman's clubs. These are offered in three styles of leather finish, antique, premium or hand dyed and the range of colours available with satisfy even the most discerning of buyers. So no matter where the club chair is to be used, a leather club chair will be just right, the choice is yours, we know that you will not be disappointed, nor will those lucky enough to use it.